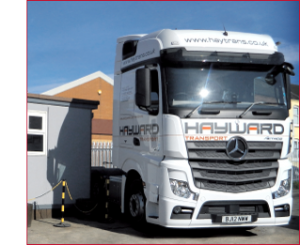 Here you’ll find information about our long-established and respected haulage company, Hayward Transport. Our flexible, tailored approach and commitment to excellence in meeting deadlines in our work transporting your cargo, has earned us an enviable reputation since we began in 1919. Working with blue chip shipping and logistics companies, we undertake work for the likes of TK Maxx, Sainsbury’s and Goodyear. Don’t hesitate to contact us if you’d like to know more or find out about how our services could benefit your business. Think of us as “The People’s Haulier” – we won’t let you down. While you’re here, please take a look at our latest news which gives you a taste of life behind the scenes at Hayward Transport. We love to support passionate individuals and organisations working for a greater good, and ultimately grow your business by underpinning your delivery service.